Based on new documents from the Snowden archive and interviews with sources familiar with the malware investigation at Belgacom, The Intercept and its partners have established that the attack on Belgacom was more aggressive and far-reaching than previously thought. It occurred in stages between 2010 and 2011, each time penetrating deeper into Belgacom’s systems, eventually compromising the very core of the company’s networks. Publicly, Belgacom has played down the extent of the compromise, insisting that only its internal systems were breached and that customers’ data was never found to have been at risk. But secret GCHQ documents show the agency gained access far beyond Belgacom’s internal employee computers and was able to grab encrypted and unencrypted streams of private communications handled by the company. Belgacom invested several million dollars in its efforts to clean-up its systems and beef-up its security after the attack. However, The Intercept has learned that sources familiar with the malware investigation at the company are uncomfortable with how the clean-up operation was handled—and they believe parts of the GCHQ malware were never fully removed. The revelations about the scope of the hacking operation will likely alarm Belgacom’s customers across the world. The company operates a large number of data links internationally (see interactive map below), and it serves millions of people across Europe as well as officials from top institutions including the European Commission, the European Parliament, and the European Council. The new details will also be closely scrutinized by a federal prosecutor in Belgium, who is currently carrying out a criminal investigation into the attack on the company. Sophia in ’t Veld, a Dutch politician who chaired the European Parliament’s recent inquiry into mass surveillance exposed by Snowden, told The Intercept that she believes the British government should face sanctions if the latest disclosures are proven. Other similarly sophisticated state-sponsored malware attacks believed to have been perpetrated by Western countries have involved Stuxnet, a bug used to sabotage Iranian nuclear systems, and Flame, a spy malware that was found collecting data from systems predominantly in the Middle East. What sets the secret British infiltration of Belgacom apart is that it was perpetrated against a close ally—and is backed up by a series of top-secret documents, which The Intercept is now publishing. The origins of the attack on Belgacom can be traced back to 2009, when GCHQ began developing new techniques to hack into telecommunications networks. The methods were discussed and developed during a series of top-secret “signals development” conferences, held annually by countries in the so-called “Five Eyes” surveillance alliance: the United States, the United Kingdom, Australia, New Zealand, and Canada. When communications are sent across networks in encrypted format, it makes it much harder for the spies to intercept and make sense of emails, phone calls, text messages, internet chats, and browsing sessions. For GCHQ, there was a simple solution. The agency decided that, where possible, it would find ways to hack into communication networks to grab traffic before it’s encrypted. The British spies identified Belgacom as a top target to be infiltrated. The company, along with its subsidiary Belgacom International Carrier Services, plays an important role in Europe, and has partnerships with hundreds of telecommunications companies across the world—in Africa, Asia, Europe, the Middle East, and the United States. The Belgacom subsidiary maintains one of the world’s largest “roaming” hubs, which means that when foreign visitors traveling through Europe on vacation or a business trip use their cellphones, many of them connect to Belgacom’s international carrier networks. The Snowden documents show that GCHQ wanted to gain access to Belgacom so that it could spy on phones used by surveillance targets travelling in Europe. But the agency also had an ulterior motive. Once it had hacked into Belgacom’s systems, GCHQ planned to break into data links connecting Belgacom and its international partners, monitoring communications transmitted between Europe and the rest of the world. 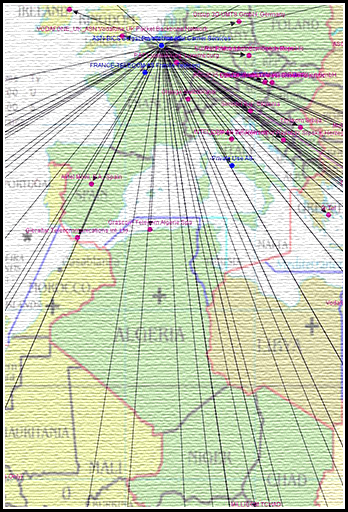 A map in the GCHQ documents, named “Belgacom_connections,” highlights the company’s reach across Europe, the Middle East, and North Africa, illustrating why British spies deemed it of such high value. GCHQ documents show that it maintains special databases for this purpose, storing details about computers used by engineers and system administrators who work in the nerve center, or “network operations center,” of computer networks worldwide. Engineers and system administrators are particularly interesting to the spies because they manage networks—and hold the keys that can be used to unlock large troves of private data. GCHQ developed a system called NOCTURNAL SURGE to search for particular engineers and system administrators by finding their IP addresses, unique identifiers that are allocated to computers when they connect to the internet. In early 2011, the documents show, GCHQ refined the NOCTURNAL SURGE system with the help of its Canadian counterparts, who had developed a similar tool, named PENTAHO. GCHQ narrowed down IP addresses it believed were linked to the Belgacom engineers by using data its surveillance systems had collected about internet activity, before moving into what would be the final stages prior to launching its attack. The documents show that the agency used a tool named HACIENDA to scan for vulnerable potential access points in the Belgacom’s networks; it then went hunting for particular engineers or administrators that it could infect with malware. The British spies, part of special unit named the Network Analysis Center, began trawling through their vast repositories of intercepted Internet data for more details about the individuals they had identified as suspected Belgacom engineers. The spies used the IP addresses they had associated with the engineers as search terms to sift through their surveillance troves, and were quickly able to find what they needed to confirm the employees’ identities and target them individually with malware. Top-secret GCHQ documents name three male Belgacom engineers who were identified as targets to attack. The Intercept has confirmed the identities of the men, and contacted each of them prior to the publication of this story; all three declined comment and requested that their identities not be disclosed. A GCHQ document reviewing operations conducted between January and March 2011 noted that the hack on Belgacom was successful, and stated that the agency had obtained access to the company’s systems as planned. By installing the malware on the engineers’ computers, the spies had gained control of their machines, and were able to exploit the broad access the engineers had into the networks for surveillance purposes. By December 2011, as part of a second “surge” against Belgacom, GCHQ identified other cellphone operators connecting to company’s network as part of international roaming partnerships, and successfully hacked into data links carrying information over a protocol known as GPRS, which handles cellphone internet browsing sessions and multimedia messages. GCHQ had accomplished its objective. The agency had severely compromised Belgacom’s systems and could intercept encrypted and unencrypted private data passing through its networks. The hack would remain undetected for two years, until the spring of 2013. In the summer 2012, system administrators detected errors within Belgacom’s systems. At the company’s offices on Lebeau Street in Brussels, a short walk from the European Parliament’s Belgian offices, employees of Belgacom’s BICS subsidiary complained about problems receiving emails. The email server had malfunctioned, but Belgacom’s technical team couldn’t work out why. Belgacom’s internal security team began to suspect that the systems had been infected with some sort of virus, and the company decided it was time to call in outside experts. It hired Dutch computer security firm Fox-IT to come and scan the systems for anything suspicious. Before long, Fox-IT discovered strange files on Belgacom’s email server that appeared to be disguised as legitimate Microsoft software. The suspicious files had been enabling a highly sophisticated hacker to circumvent automatic Microsoft software updates of Belgacom’s systems in order to continue infiltrating the company’s systems. About a month after Belgacom had identified the malicious software, or malware, it informed Belgian police and the country’s specialist federal computer crime unit, according to sources familiar with the incident. Belgian military intelligence was also called in to investigate the hack, together with Fox-IT. The experts from Fox IT and military intelligence worked to dissect the malware on Belgacom’s systems, and were shocked by what they found. In interviews with The Intercept and its reporting partners, sources familiar with the investigation described the malware as the most advanced they had ever seen, and said that if the email exchange server had not malfunctioned in the first place, the spy bug would likely have remained inside Belgacom for several more years. While working to assess the extent of the infection at Belgacom, the team of investigators realized that the damage was far more extensive than they first thought. The malware had not only compromised Belgacom’s email servers, it had infected more than 120 computer systems operated by the company, including up to 70 personal computers. The most serious discovery was that the large routers that form the very core of Belgacom’s international carrier networks, made by the American company Cisco, were also found to have been compromised and infected. The routers are one of the most closely guarded parts of the company’s infrastructure, because they handle large flows of sensitive private communications transiting through its networks. Either way, the malware investigators at Belgacom never got a chance to study the routers. After the infection of the Cisco routers was found, the company issued an order that no one could tamper with them. Belgacom bosses insisted that only employees from Cisco could handle the routers, which caused unease among some of the investigators. A spokesman for Cisco declined to comment on the Belgacom investigation, citing company policy. “Cisco does not comment publicly on customer relationships or specific customer incidents,” the spokesman said. Shortly after the malware was found on the routers, Fox-IT was told by Belgacom to stop its investigation. Researchers from the Dutch security company were asked to write-up a report about their findings as soon as possible. Under the conditions of a non-disclosure agreement, they could not speak about what they had found, nor could they publicly warn against the malware. Moreover, they were not allowed to remove the malware. Between late August and mid-Sept. 2013, there was an intense period of activity surrounding Belgacom. On August 30, some parts of the malware were remotely deleted from the company’s infected systems—apparently after the British spies realized that it had been detected. But the malware was not completely removed, according to sources familiar with the investigation. Two weeks later, on Sept. 14, employees from Belgacom, investigators, police and military intelligence services began an intensive attempt to completely purge the spy bug from the systems. During this operation, journalists were tipped off for the first time about the malware investigation. The Intercept’s Dutch and Belgian partners NRC Handelsblad and De Standaard reported the news, disclosing that sources familiar with the investigation suspected NSA or GCHQ may have been responsible for the attack. Then, on Sept. 20, German news magazine Der Spiegel published documents from Snowden revealing that British spies were behind the hack, providing the first confirmation of the attacker’s identity. In the aftermath of the revelations, Belgacom refused to comment on GCHQ’s role as the architect of the intrusion. Top officials from the company were called to appear before a European Parliamentary committee investigating the extent of mass surveillance revealed by Snowden. People with knowledge of the malware investigation watched Belgacom’s public statements with interest. And some of them have questioned the company’s version of events. Belgacom declined to comment for this story, citing the ongoing criminal investigation in Belgium. Last month, The Intercept confirmed Regin as the malware found on Belgacom’s systems during the clean-up operation. The spy bug was described by security researchers as one of the most sophisticated pieces of malware ever discovered, and was found to have been targeting a host of telecommunications networks, governments, and research organizations, in countries such as Germany, Iran, Brazil, Russia, and Syria, as well as Belgium. GCHQ has refused to comment on Regin, as has the NSA, and Belgacom. But Snowden documents contain strong evidence, which has not been reported before, that directly links British spies to the malware. One GCHQ document about the use of hacking methods references the use of “Legspin” to exploit computers. Another document describes “Hopscotch” as part of a system GCHQ uses to analyze data collected through surveillance. Ronald Prins, director of the computer security company Fox-IT, has studied the malware, and played a key role in the analysis of Belgacom’s infected networks. This article first appeared at The Intercept.